Aerial shot from the day of the accident, published on Facebook. TBILISI, DFWatch–Six people are still missing after the landslide in Dariali Valley on May 17, among them Georgians, Ukrainians and Turkish citizens, according to the Georgian interior minister. 12 Turkish citizens were rescued out of a tunnel, while two drivers of trucks that were caught in the landslide were brought to safety. Interior Minister Alexandre Chikaidze said Tuesday that salvage crews have not been able to find any of the six who are missing. The search had to be suspended on Monday due to bad weather. The road through Larsi border crossing between Georgia and Russia is still closed for traffic and will remain so until the clean-up work is completed. There is currently serious flooding of the River Tergi. 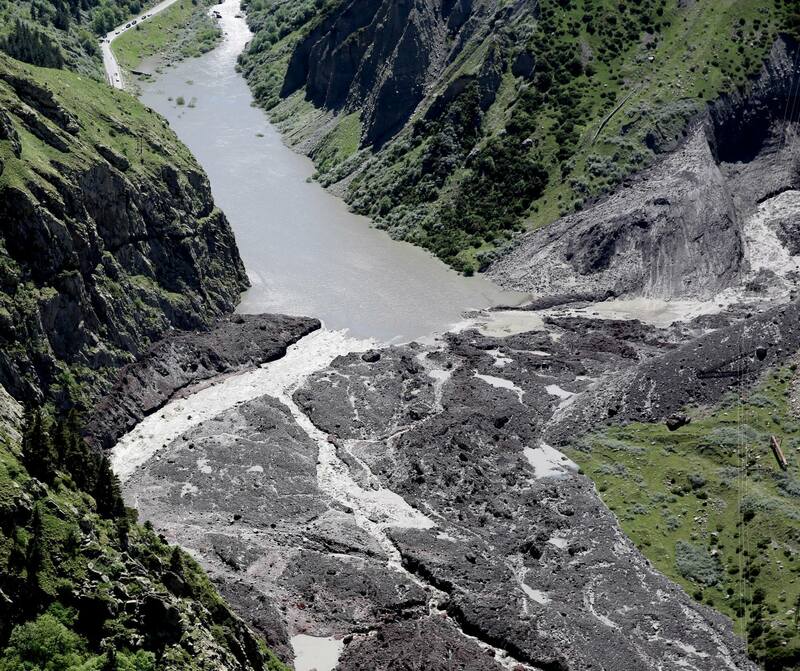 An interim geological report about the disaster, published by the Environment Protection Ministry, says it began at 09:30 in the morning of May 17, as there was a catastrophic buildup of mud at the point where the rivers Tergi and Amali-Devdoraki meet. But the environmental group Green Alternative, which warned two years ago about the danger of constructing hydroelectric dams in Dariali Valley, issued a statement on Monday reiterating that environmental concerns have been ignored in the process. “Green Alternative indicated a number of times that a number of environmental issues were ignored in issuing construction permits and making environmental impact assessments for Dariali and Larsi hydro power plants,” the group said. One Ukrainian citizen died in the Dariali Valley disaster. More than 160 people were rescued.